The great thing about being in big families, is sometimes you’re not the only one going through something new, like a pregnancy. My cousin Jessica is also expecting and is due in June, and on my husband’s side of the family, his cousin Jenny is due in May, and his cousin’s wife Bethany is also due in June. So since his side of the family is pretty spread apart, we had 1 baby shower for the 3 of us. It was a lot of fun and a little less pressure from the spotlight that is pregnancy. 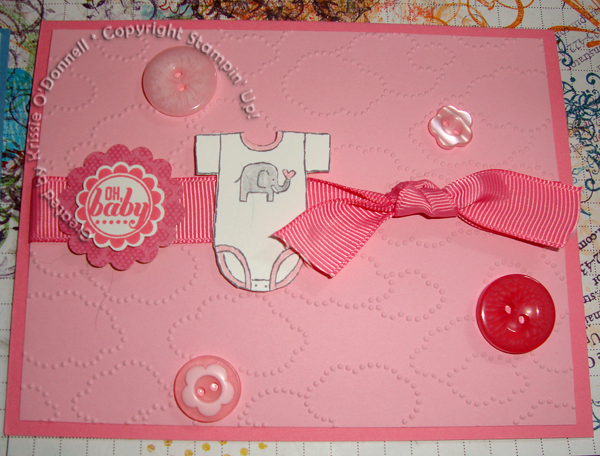 This is the card I made for Jenny as she’s having a girl. And I made a very similar card for Bethany, who is having a boy. Stamps: Baby Tees (wheel converted to clear mount stamp), Ciao Baby! Accessories: Stampin Write Markers – Daffodil Delight, Bashful Blue, Pretty in Pink; Aquapainter, 7/8″ Scallop Circle punch, 1-1/4″ Scallop Circle Punch, Regal Rose grosgrain ribbon (retired), Marina Mist 1/8″ taffeta ribbon, subtles designer buttons. 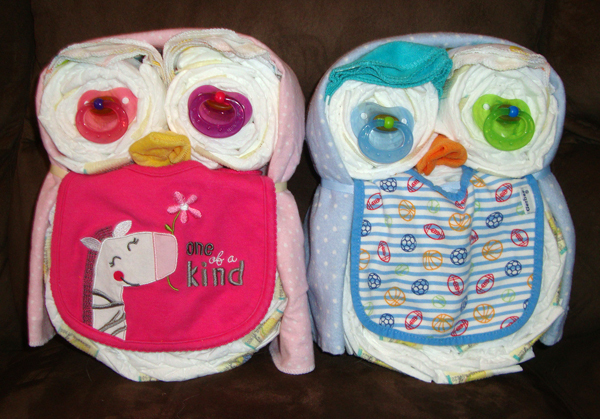 For their gifts I made them diaper cake owls, which I later found out that Jenny had owls in mind for her little girl’s nursery theme. How perfect! I love how the owls turned out. They featured lots of necessities for baby to create all the owl’s features. I found the idea on Pinterest (where else?) and made a few tweaks of my own to create more useful supplies for the eyes and better looking eyebrows.